A woman may have been created from Adam's rib down on planet Earth, but her charms will certainly follow man into outer space, making her the most utterly irresistible creature in this Galaxy and beyond (some alien monstrosities may disagree). Jane Fonda playing Barbarella in the 1968 movie of the same title seems equally comfortable and enchanting in furs, as well as in spacesuits (and out of them, we have to add, fondly remembering the movie's opening scene). This feline barbarian purrs from the screen in a typical French fashion, amid French-designed sets and psychedelic decorations. The plot and movie dialogues are mind-numbingly cheesy & primitive, yet nobody seems to mind: the viewers did not care much in the 60s and most don't care to dissect it critically today. Like they say, "this movie has a cult following". David Gilmour (of the future Pink Floyd fame) participated in recording the film's original score. The film's scientist character inspired the 80s famous group to call themselves Duran Duran. The Great Tyrant in the movie calls her "Pretty-pretty", as in "So, my pretty-pretty; we meet again." That line should've been in Austin Powers, for sure. 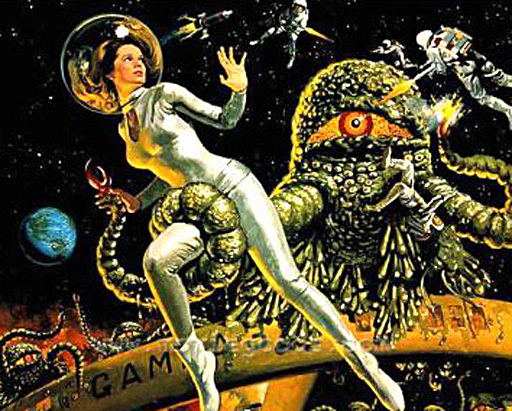 There are rumors of Kate Beckinsale being approached for the big-budget remake of Barbarella. Hopefully, they are going to use French designers for the movie's look, too. This section will be expanded. Please send us the movies & actresses worth mentioning. Listen to a very groovy song (written by Alexey Rybnikov) from this movie here. We will continue to highlight the glamour of the space-ways; in our next issue we will show the most interesting female characters in fantastic pulp fiction magazines. "Angels don't make love... Angels ARE Love!" When I was young, I discovered a stack of Playboys from the '60s in my uncle's old room in my grandmother's basement. One of them had a pictorial of the set of Barbarella you would've loved. I would like to see some screen shots of the fantastic outfits from "The Third Element", especially the air/space line hostesses! Thanks for the UFO pics. Great show, with some very attractive space ladies: Gabrielle Drake, Ayshea, Wanda Ventham, Delores Mantez and Antonia Ellis. Also don't forget Christine Kochanski in Red Dwarf and many Doctor Who companions and Star Trek and... I just exposed myself for the ubernerd I am. Avi, you are right. We do rule the earth and rightly so! Thanks again for your great website. A day is not complete without my Dark Roasted Blend. Anonymous, do you mean The FIFTH Element? what about nova from planet of the apes? The Remake has Rose McGowan playing Barbarella and is being directed by Robert Rodriguez. Just thought you would appreciate the Info. Superb post, a subject after my own heart. A wonderful post and a very choice pictures. What about Star Trek or Lost in Space? Thank you Bishop. Great restoration!